On 3 April 2012, the Prosecutor of the International Criminal Court issued a two-page statement declining to proceed with an investigation into alleged atrocities perpetrated in Gaza during Operation Cast Lead in December 2008 and January 2009. A distinguished commission of inquiry set up in 2009 by the United Nations Human Rights Council and presided over South African judge Richard Goldstone concluded atrocities had taken place. It recommended that investigations be taken up by the Court. The disappointing statement from the Prosecutor reveals his ideological bias, and confirms the politicization of the International Criminal Court. The Court would not normally have jurisdiction over the conflict because neither Israel nor Palestine are members of Court. As a general principle, the Court only operates with respect to the territory and the citizens of its member states. Exceptionally, it can also act when authorized by the Security Council, as it is doing in Sudan and Libya. It is also possible for a state that has not joined the Court to make a declaration agreeing that it may exercise jurisdiction over its territory and its citizens. The West African country of Côte d’Ivoire did this some years ago, and the man who made the declaration — former president Laurent Gbagbo — is now in prison in The Hague awaiting his trial by the Court. Palestine invoked the same mechanism in January 2009, filing a declaration signed by the Minister of Justice of the Palestinian Authority. But can Palestine can be considered “a State”? Only only “a State” can validly make such a declaration. For more than three years, the Prosecutor has been soliciting opinions on the subject. He hosted a round table in The Hague at which conflicting views on Palestinian statehood were presented. Finally, he has concluded that the determination is not his to make. He says this is the remit of the United Nations Secretary-General or the General Assembly, or possibly the Court’s own governing body known as the Assembly of States Parties. The Prosecutor’s interpretation of the Rome Statute is debatable. In Palestine’s favour, he acknowledges that it has been recognized as such by some 130 countries as well some international organizations. He makes a rather arcane distinction between Palestine and an entity whose claim to statehood is far more dubious, the Holy See, by noting that the latter sits in the General Assembly as a “non-member state” whereas Palestine sits as an “observer”. Finally, he invokes Palestine’s failed application to join the United Nations in 2011. In effect, Palestine was blocked from membership by the Security Council. He might well have seen the facts differently, noting the porosity of the terminology used by the General Assembly, or pointing to other entities like the Cook Islands that have a lower status than Palestine at the United Nations yet have successfully joined the Court after being deemed “a State” by the Secretary-General. While dressed up in legal terminology with what at first glance looks to be judicial objectivity, there is actually a lot of politics in the Prosecutor’s conclusion. The Prosecutor has spoken very eloquently about dealing with impunity in Africa. But when it comes to the Middle East, given the chance to address one of the world’s major conflicts, and following direction from the United Nations Commission of Inquiry, he has chosen a dramatically more conservative approach. Clearly, he has no taste for wading into a conflict that would anger the United States and some of its close allies. When it comes to the Security Council and especially the interests of its Permanent Members, the Prosecutor is on his best behavior. He is extremely deferential to powerful countries in the global North, in contrast with the dismissive attitude taken to other international organizations like the African Union. 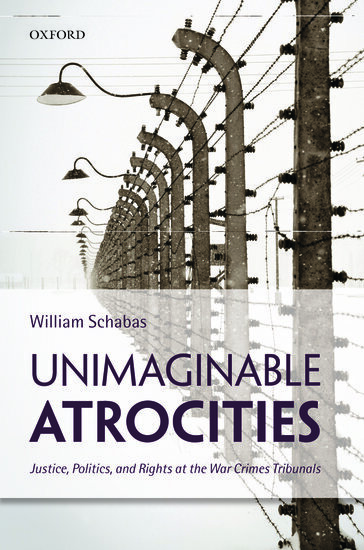 William A. Schabas is the author of Unimaginable Atrocities: Justice, Politics, and Rights at the War Crimes Tribunals. He is professor of international law at Middlesex University in London, professor of international criminal law and human rights at Leiden University, professor of human rights law at the National University of Ireland Galway, chairman of the Irish Centre for Human Rights, and a visiting professor at the Paris School of International Affairs (Sciences-Po). He is the author of more than 20 books and 300 journal articles, on such subjects as the abolition of capital punishment, genocide and the international criminal tribunals. Professor Schabas was a member of the Sierra Leone Truth and Reconciliation Commission. He is a president of the Irish Branch of the International Law Association and chair of the Institute for International Criminal Investigation. He is an Officer of the Order of Canada and a member of the Royal Irish Academy and holds several honorary doctorates. Goldstone himself has admitted that his report was deeply flawed and one-sided. Why are you giving space to the ravings of a “scholar” whose anti-American and anti-Israeli bias is so blatant, and whose interest in “justice” is highly questionable?